MINIX is a Unix-like computer operating system based on a microkernel architecture created by Andrew S. Tanenbaum for educational purposes; MINIX also inspired the creation of the Linux kernel. MINIX (from "mini-Unix") was first released in 1987, with its complete source code made available to universities for study in courses and research. It has been free and open source software since it was re-licensed under the BSD license in April 2000. Version 3.1.5 was released 5 November 2009. It contains X11, emacs, vi, cc, gcc, perl, python, ash, bash, zsh, ftp, ssh, telnet, pine, and over 400 other common Unix utility programs. With the addition of X11, this version marks the transition away from a text-only system. It can also withstand driver crashes. In many cases it can automatically replace drivers without affecting running processes. This feature will be improved in future releases. In this way, MINIX is self-healing and can be used in applications demanding high reliability. MINIX 3 also has support for virtual memory management, making it suitable for desktop OS use. Desktop applications such as Firefox and OpenOffice.org are not yet available for MINIX 3 however. 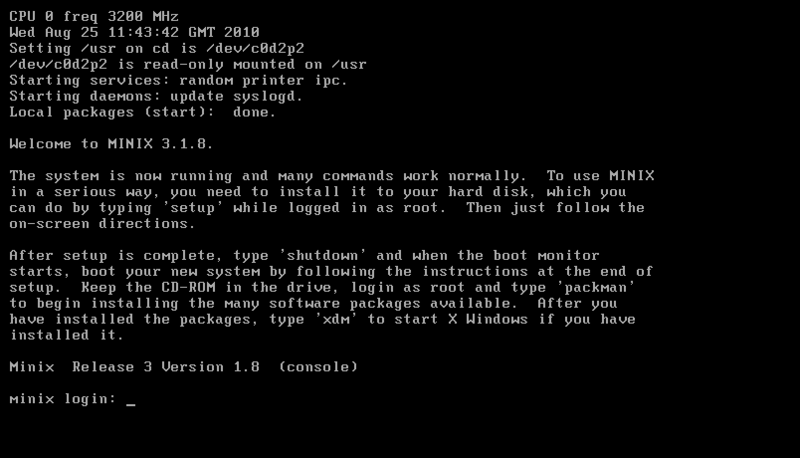 With the creation of MINIX 3, and its transition to a graphical interface, some commercial software and hardware developers have started to implement some systems with MINIX in the late 2000s. The design principles Tanenbaum applied to MINIX greatly influenced the design decisions Linus Torvalds applied in the creation of the Linux kernel. Torvalds used and appreciated MINIX, however, his design deviated from the MINIX architecture in significant ways, most notably by employing a monolithic kernel instead of a microkernel. This was famously disapproved of by Tanenbaum in the Tanenbaum–Torvalds debate. Tanenbaum explained again his rationale for using a microkernel in May 2006. In May 2004, Kenneth Brown of the Alexis de Tocqueville Institution made the accusation that major parts of the Linux kernel had been copied from the MINIX codebase, in a book called Samizdat. These accusations were rebutted universally—most prominently by Andrew Tanenbaum himself, who strongly criticised Kenneth Brown and published a long rebuttal on his own personal website. When free and open source Unix-like operating systems such as Linux and 386BSD became available in the early 1990s many volunteer software developers abandoned MINIX in favor of these. In April 2000, MINIX became free/open source software under a permissive free software license, but by this time other operating systems had surpassed its capabilities, and it remained primarily an operating system for students and hobbyists.